Men in suits order takeaway cappuccinos at the counter. A trendy young crowd occupies comfortable sofas, armed with laptops for a brain-storming session over cafe lattes, frappuccinos and soft jazz. The morning scene wouldn’t raise an eyebrow in New York, London or Paris but cafe culture is a new phenomenon in Nigeria’s biggest city, where until recently finding a decent espresso was a battle. The bright young things and senior managers were in Cafe Neo, on Victoria Island in Lagos, which has been specifically designed to cater to the tastes of “repats”. Ngozi Dozie and his brother Chijoke created the chain with returning Nigerians in mind, in the full knowledge that years spent abroad alter views, tastes and expectations. Now the brothers hope to conquer Africa’s major cities with 100% African coffee before giants of the business such as Starbucks try to capture the market. “The demand (in Lagos) is very high. There’s a significant minority of people who love coffee and want to drink coffee but haven’t had access to coffee,” Ngozi told AFP. The “significant minority” have studied and worked abroad, coming back in their thousands from the United States or Europe as austerity measures kicked in after the global financial crisis. While they were away, Nigeria – already Africa’s most populous nation with some 170 million people – became the continent’s leading economy — and a country ripe with opportunity. With economic growth has come an emerging middle class, which has increased six fold to 4.1 million households between 2000 and 2014, according to a recent study by Standard Bank. A number of US chains such as KFC and Domino’s Pizza are already in Nigeria and increasingly popular, despite the astronomical costs of running a business in the country. Poor or non-existent infrastructure forces businesses to rely on huge electricity generators to keep the lights on when the public supply goes off, sometimes for up to 12 hours a day. 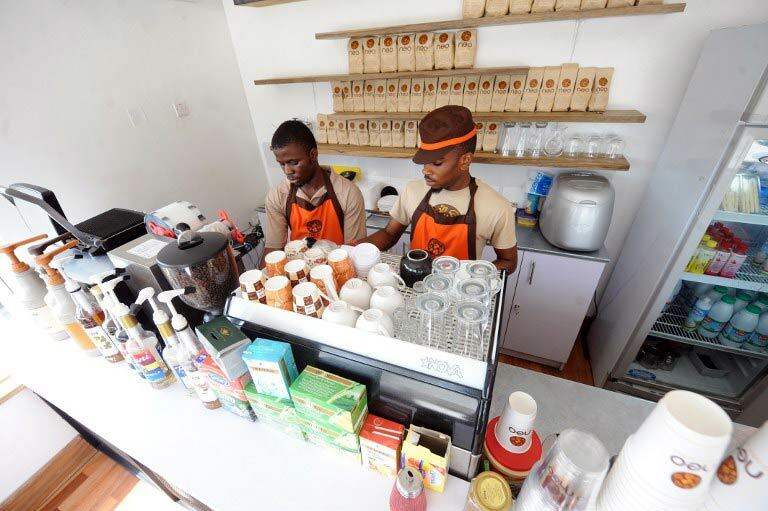 The brothers’ idea is to first conquer the Nigerian market before Starbucks, which has more than 20 000 cafes in 65 countries across the globe but none in sub-Saharan Africa. Ngozi Dozie is not yet 40 and is himself a “repat”. Before embarking on the business venture, he knew friends who would bring back bags of coffee from the United States. He said he was inspired by India, where Cafe Coffee Day has largely cornered the market, despite the increasing presence of international chains such as Britain’s Costa Coffee or Starbucks. “India is a fantastic example with Cafe Coffee Day,” he explained. “We aim at something similar. 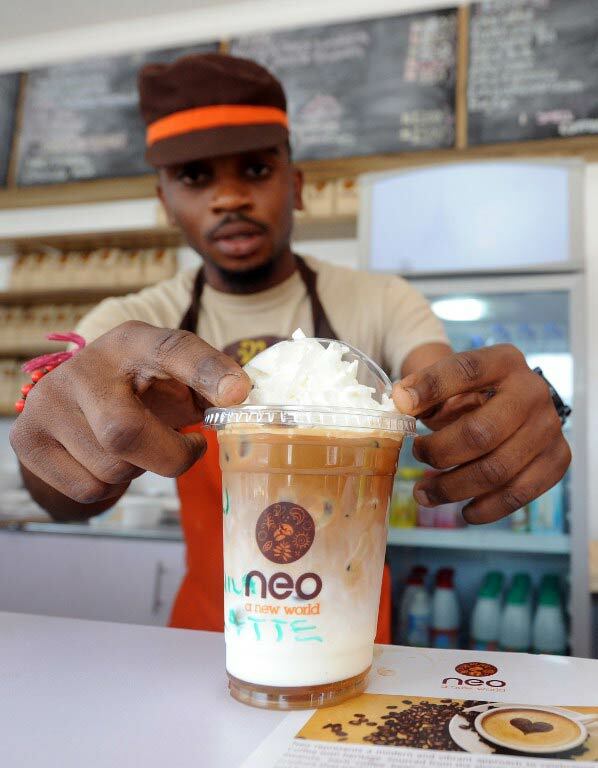 Neo has three cafes currently in Lagos and two others are scheduled to open early this year. There is another outlet in Kigali. All the cafes only serve 100% Rwandan arabica, which has become one of its main selling points. The chain is hoping to branch out across Africa and expects to have between 20 and 30 cafes in Lagos alone within the next four years. “Neo, in Tswana, the language in Botswana, means ‘gift’, and of course it also means ‘new’ in Latin,” said Dozie. Africa’s main coffee producers such as Ethiopia, Uganda and Rwanda currently export most of their products to the United States and Europe. Kayitana John Bosco was brought over to Nigeria from Rwanda to train locals on how to make a proper coffee at Cafe Neo – and said it was time for a change. “Our first coffee tree was planted in 1904,” he said of his homeland. “We’ve been producing coffee for more than a century. But brewing, the consumption… it’s really still down. “I visited a coffee farmer in 2007. That old man had been doing coffee farming for 20 years, but he didn’t know the taste of it.